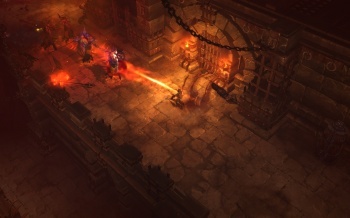 The Diablo III beta, which began internal testing at Blizzard last week, will be in the hands of gamers as soon as July. The Q1 2011 Activision-Blizzard Financial Conference Call focused on World of Warcraft making money (who knew? ), the developer being "hard at work" on its Starcraft II expansion and busy scaling its new MMO team. What most gamers want to hear, however, is that Blizzard is still targeting a fall release for Diablo III. Of course we are talking about Blizzard, so curb your expectations. Activision COO Thomas Tippl said that Blizzard will release two games next year, if Diablo III doesn't make it to stores by January - that he would mention the obvious seems telling of Blizzard's confidence in making its proposed release window. The good news is that before the game's release, players will have access to the beta sometime between July and September. There are no details on what the beta will contain, at this time, but, judging by the wealth of features and content in its Starcraft II beta, it should hold Diablo fans over for the next couple years. Oops, I mean months.